The first F1 race of 2012 is behind us and we talk about the watch parties in Austin, local reactions and more COTA stuff. And check out our experience with the family truckster. Yep we got to drive it. We drive the Family Truckster…Really! Austin Grand Prix with Kerry & Kevin Olsen at Z Tejas. K1 Speed- Indoor Karting in Austin. Bruce Knox (Exec Vp of COTA) Twitter & his F1 race predictions. McPherson College for Auto Restoration- A FOUR year degree program. Phoenix Garage org Sluggo the car hauler. The “See You at The Circuit” campaign. 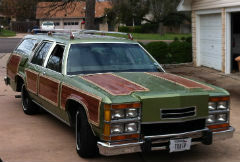 We drive the Vacation movie’s “Queen’s Family Truckster” for www.HomeAway.com . As seen in the first Vacation movie & the Superbowl commercial. Austin Police hone their crowd management plan using SXSW. Ron Howard (Twitter acct) producing a Formula 1 movie called RUSH. Race Tracks in the area.